Seeing the World a Little Differently. When I started at EDAX five years ago, I knew very little about materials analysis. My education was in Management Information Systems and Computer Science and my work experience came from spending eight years in the Sports Information department at Rowan University. Little by little, I have learned more about the various analysis techniques and feel comfortable enough to write this blog. One of the first things that caught my eye at EDAX was a series of maps generated from Energy Dispersive Spectroscopy (EDS) and Electron Backscatter Diffraction (EBSD) analysis. The vibrant colors and patterns are very beautiful and almost look like art. Lately, I have noticed objects in everyday life that remind me of these maps. This past July, my wife and I and our friend took a trip to Ireland. We visited Slieve League in county Donegal, one of the highest sea cliffs in Europe (1,998 feet from the highest point). 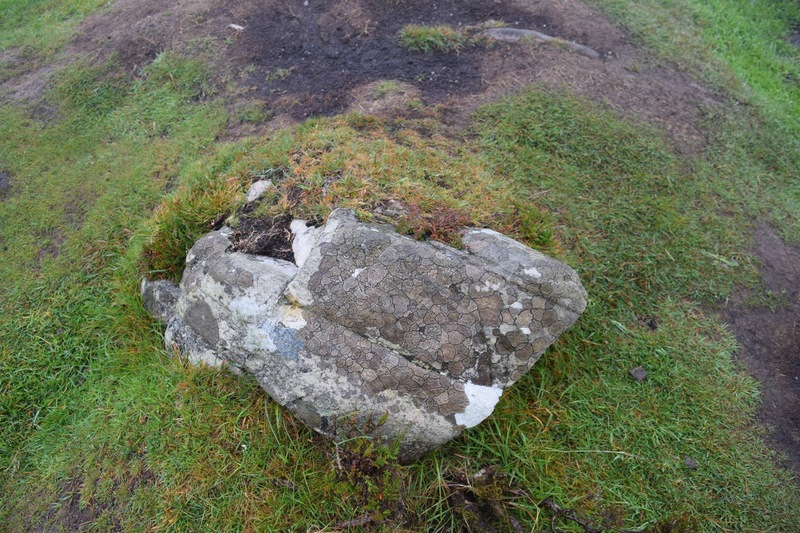 We decided to hike up the cliffs for a bit and on our way up the rocky pathway on this rainy, foggy day, I came across a large rock that grabbed my attention. 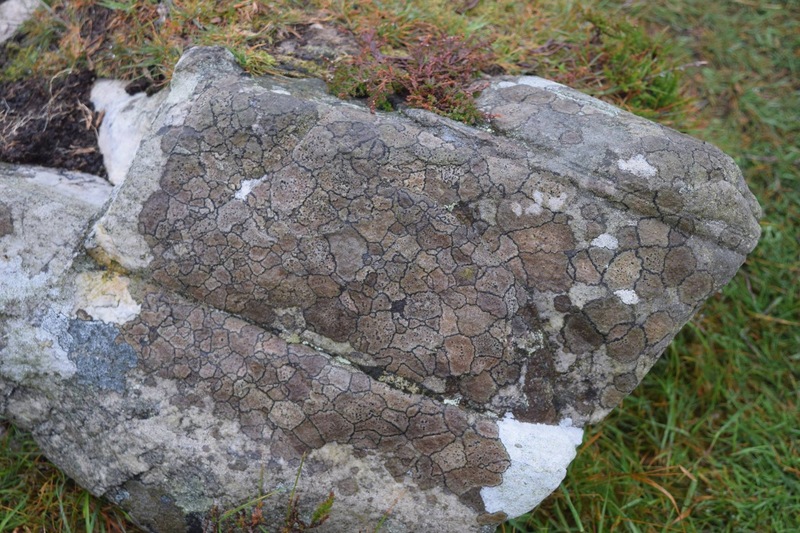 It was covered in a pattern that reminded me of an EBSD map showing grain boundaries. I quickly snapped a few photos (below) to show to our EBSD product manager, Matt Nowell when I returned. Photos of a rock taken at Slieve League in Donegal, Ireland. A few weeks later, I was at a restaurant in the St. Louis Lambert International Airport having dinner with a few of my coworkers following a successful Microscopy & Microanalysis (M&M) show. 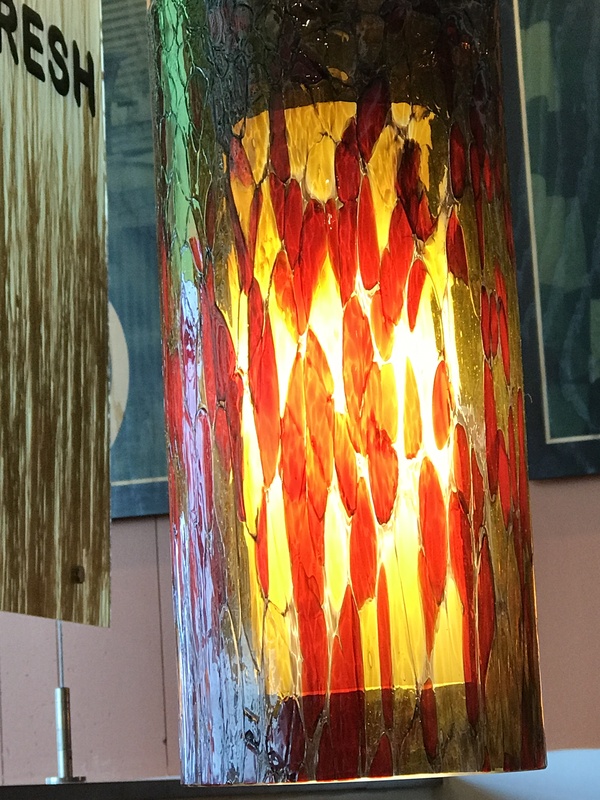 While we were waiting for the waitress to return with our food, I looked up at the light hanging over the table next to ours and noticed that it resembled an EBSD pattern. I found another example of a beautiful glass piece when I was decorating my Christmas tree with my wife a few weeks ago. 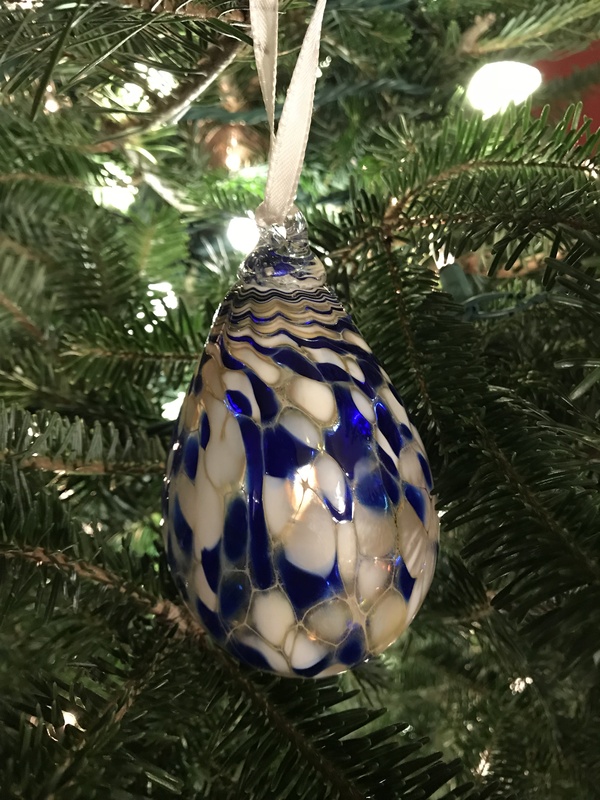 My wife’s grandmother and aunt give her gorgeous hand-blown glass ornaments from Cape Cod every year. As I was hanging one on the tree, I took a photo and explained to her that it looked like the maps we produce at work. Light in a restaurant at the St. Louis Lambert International airport. One of my family’s hand-blown glass Christmas ornaments. Ever since I was little, I have had a fascination with the ocean and sharks in particular. 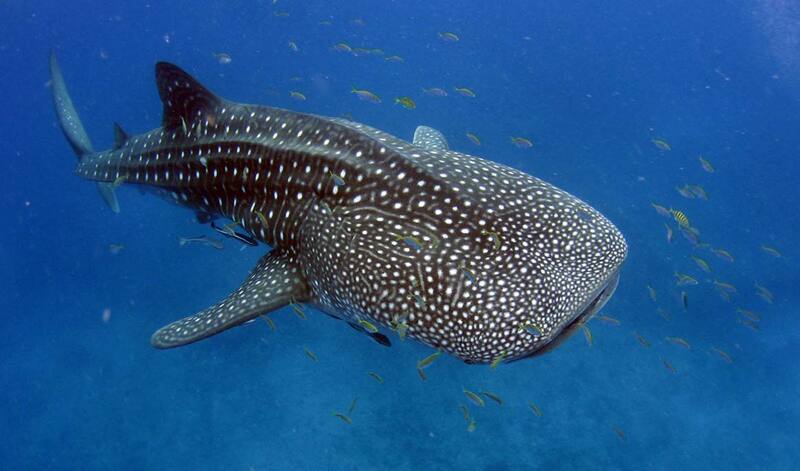 One of my favorite species is the Rincodon typus, more commonly known as a whale shark. It is not only the largest living nonmammalian vertebrate, but the whale shark has a very particular pattern of pale yellow spots and stripes on its skin. When I was putting together the EDAX Interactive Periodic Table of Elements (http://www.edax.com/resources/interactive-periodic-table), I came across a map of nickel nanopillars on indium at 3 kV demonstrating low kV microanalysis, and I immediately though it resembled a whale shark. Rincodon typus, commonly known as a whale shark. 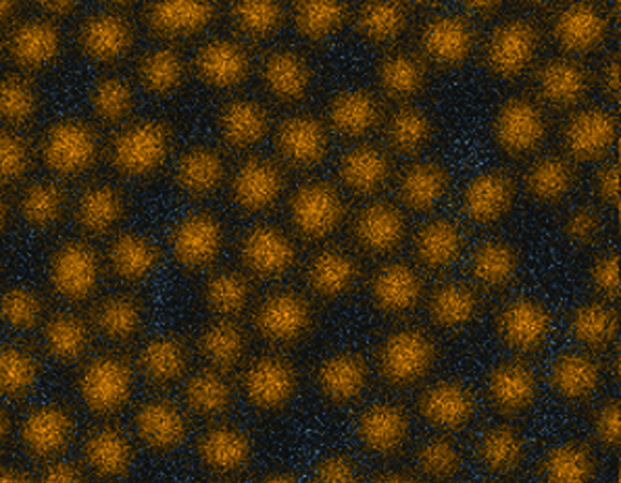 Low kV microanalysis: nickel nanopillars on indium at 3 kV. My final example comes from one of my favorite television shows, The Curse of Oak Island on the History Channel. The show follows a group of men that are in search of treasure that is supposedly buried on a small island off the coast of Nova Scotia, Canada. Several theories exist as to what the treasure is exactly, ranging from Knights Templar hiding sacred religious relics to pirates burying gold and jewels. The group has uncovered many clues and they have found various interesting items including ancient coins, bones from the 1600s, and pieces of wood, ceramic, and paper. On an episode in the current season (season 5), the group discovered a rose-headed spike while metal detecting near the coast line. If I had watched this prior to working at EDAX, I probably wouldn’t have thought anything about it. However, now that I know much more about microanalysis, I immediately thought to myself that they should use EDS analysis to find out what elements the metal was comprised of, to possibly date it based on what materials were used during that period for creating spikes. As it turns out, that is exactly what they did. The team found out that the spike was comprised of 90% iron and 10% carbon with no traces of manganese or sulfur. 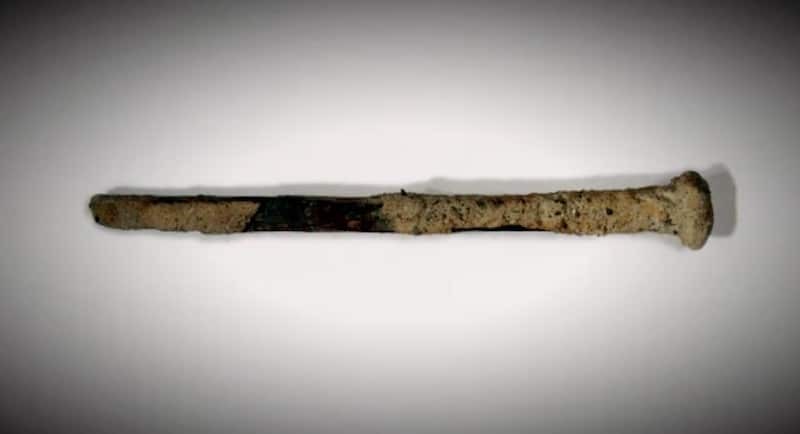 This showed that it was pre-1840s when manganese was used in metal work and that it was smelted with charcoal before the use of fossil fuels in the 1700s. All pointing to the fact that people were on Oak Island hundreds of years ago. The world of microanalysis is extremely interesting and present all around us, you just have to keep your eyes open to see where it pops up in your daily life. One of the powers of EBSD is showing how microstructures are created by the processing of a material and how these microstructures can change the material properties of a sample. Explaining this connection to novice users or potential customers can be difficult. 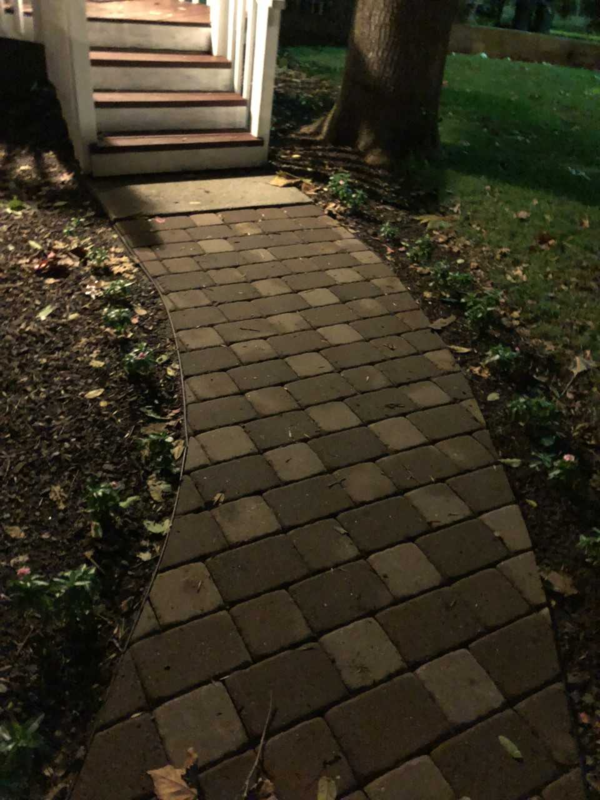 Luckily for me, my sidewalk has given me a perfect example. It is made up of oriented bricks. Some are placed square side up. Some are placed rectangular side up. But look at the color? Why are some bricks wet while others are dry? The square sides tend to be dry, rectangular still wet. Now let’s start building up a case as to why this happens. The first step is understanding how these bricks are made and what they are made of. You take clay, you slap it into a mold. You press the rectangular side to compress it to fill the mold. Fire it and tada, you have a brick. A lot is going on in these steps that you can’t see with the naked eye. The main thing is that the squeezing step is really having a profound effect on the brick. You are taking randomly oriented platy minerals (Figure 1) and giving them a preferred orientation by squeezing them (Figure 2). It is like a house of cards that has fallen down. You now have grains lying down. Water can’t break through the new “sheets”, but turn the brick on its side and you have pathways to drain the water. Figure 1. Clay minerals in bricks are often platy in shape. 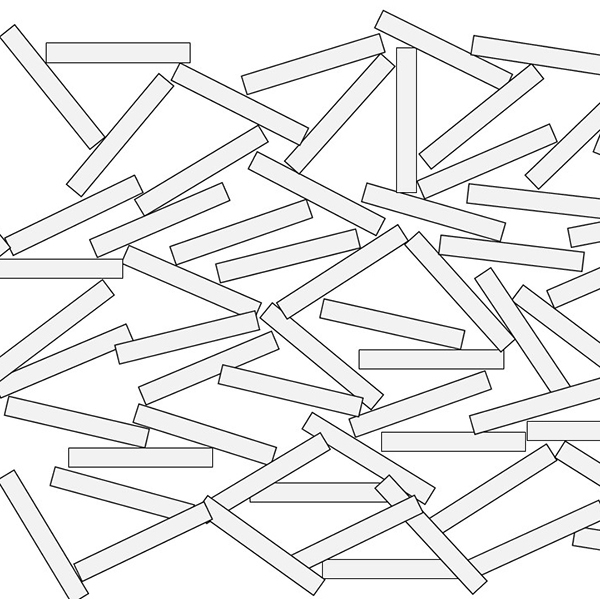 Without any outside forces, the grains are randomly orientated. FIgure 2. By compressing the material to form a brick shape, the grains are laid flat relative to each other. This is much like EBSD samples with a texture. This is what you are seeing here. 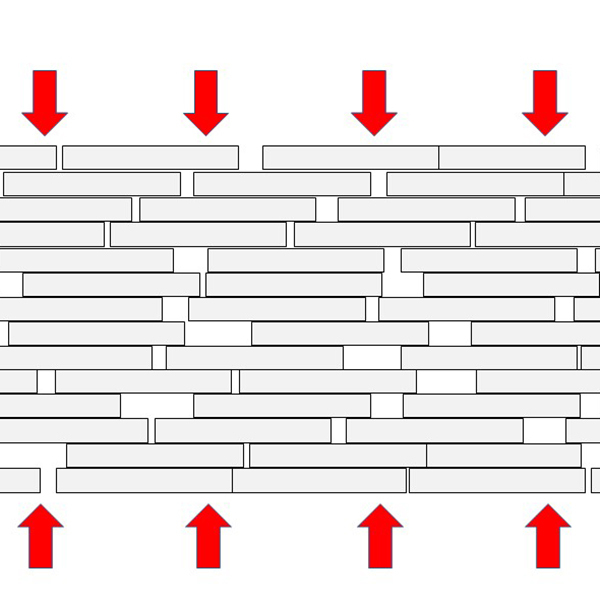 The square bricks have clays that are oriented to wick the water deeper in to the brick, while on the rectangular faces, the water has nowhere to go (Figure 3). Square bricks wick away and are dry, while rectangular faces are still wet. Figure 3. 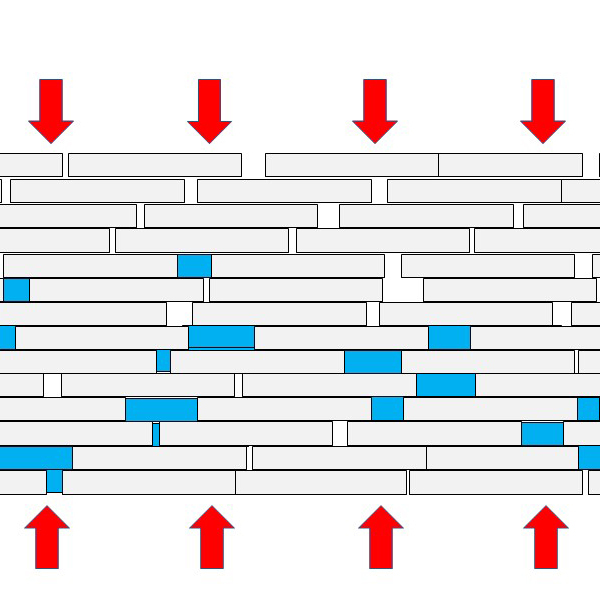 After the brick is pressed, there are no connecting paths for the water to flow into the material from the top. But from the side, there are channels leading into the bricks. This is what allows the water to wick inside the brick from the square side, but not the rectangular side. On a high level, this is what EBSD is all about. You are seeing how these processes forming a material are now controlling how the material behaves. For EBSD, these can be electrical, thermal, or mechanical properties, but EBSD is the driving force to truly understanding how and why your material behaves the way it does.